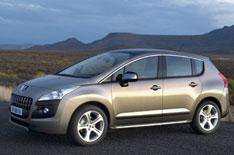 Peugeot 3008: prices and details | What Car? Peugeot has released full details of the all-new 3008. On sale in November, the Nissan Qashqai-rivalling 3008 will start at 15,995 with prices rising to 21,895. Five engines will be available in the 3008, with a choice of two 1.6-litre petrols: a 120bhp version with a five-speed manual gearbox or a turbocharged 150bhp version with a six-speed manual. Three diesels will be offered: a 110bhp or 150bhp 1.6 with a six-speed manual gearbox or a 163bhp 2.0 with a six-speed automatic 'box. CO2 emissions range for the 3008 vary from 130g/km to 176g/km.